Brushstrokes | Painting Effects Course | Toronto Technical Painting Courses | Registration Open! How do great artists create such beautiful paintings? Learn the techniques you need to actually paint. This is a NEW Toronto technical painting course. Above you can see the amazing brushstrokes of Tom Thompson. This is "wet on wet" where the colours are mixed by overlaying strokes on top of each other while they're still wet. In acrylic you'd need a soft gel medium to achieve the effect above because of the texture. Below is Rita Letendre's abstract painting. She's using a thick texture. Both paintings evoke a similar experience of the world but in very different ways. What does it take to make great looking brushstrokes rather than messy blobs? How do you get them to transform into something? What's the deal with all those brushes in the store? Why are there so many!? Which brushes? What size? Palette knives? Ahhh! And seriously, what are all those jars and bottles of mediums? They all look the same! What do they even do? How do you use these tools? How do you get the paint to do interesting things? How do you actually paint? If you've felt this frustration and confusion. You're in the right place. Shhh! I'll let you in on a secret. I have a brushstroke fetish! I have a bit of a thing for photographing close-ups of paintings. Guards don’t like it! I've photographed in museums on three continents. I go right up and zoom in on the brushstrokes. All the photos on this page are from paintings I’ve shot. I love looking at them up close and personal. Something that's fascinating is that up close paintings are frequently covered in messy vigourous brush effects that look totally different when you move back. Moving back, they suddenly transform into abstract effects or recognizable things. It's surprising. Artists develop their own approach over years of working in the studio. In my six years of post-secondary art eduction I never had a class where anyone showed me how to do painting techniques and effects. It's all stuff I've taught myself to do over 25 years of painting. There's a lot more to it than you might think. But here's the thing - it's totally learnable. How a brushstroke looks depends on the the surface you paint on, type of brush used, the consistency of the paint and mediums, the way you hold the brush, the way you move your fingers, hand, arm or even whole body, and the way the marks accumulate to create effects. There's a lot of skill and finess just in holding and moving the brushes. These images use different methods. The top one could be described as a pointalist technique which is basically small brushstrokes accumulating. The Bonnard is thin vigorous strokes. The Thompson is thick wet on wet painting where the strokes mix on the canvas while both are still wet. Brushstrokes & Painting Effects is the third course in my Technical Painting Trilogy. This course is for acrylic and oil painters. Unfortunetly, watercolour doesn't work for this course as it requires totally different methods. It doesn't matter if your paintings are realistic or abstract, landscapes or portraits, every one who paints needs to know how to properly apply the paint. Understanding painting techniques makes you a better painter. This course is about developing a huge range of methods so that you can draw on them later whenever you need them. I'm not a believer in "finding a style" and sticking to it. I think a painter needs to have lots of skills, techniques and lots of colour ranges so you can use whatever is necessary to communicate in the clearest way possible. It's time to end the frustration. This is very doable. Above Jean McEwan creates thick layers of paint. Below Rita Letendre uses thick expressive brushstrokes that are mixing right on the canvas. They're applied with brushes and knives. In oil you just use the paint directly because it keeps it's shape. In acrylic you'd need a heavy gel medium to make this happen. Substrates and Surfaces: How does changing the thing you paint on (canvas, wood, paper, mylar etc) change the effect? How does preparing the surface with gesso or other mediums determine what's possible to achieve. Gestures: The way you hold the brushes and tools, and the way you move your fingers, hand, arm and whole body is a massive factor in painting that no one trains you to do. Since this depends on what method you're using we'll be talking about it throughout the course. Brushes: There's so many. You'll learn about the differences and when to switch brushes. They come in different lengths, different sizes, different textures, different shapes. You'll actually gain an understanding of when to grab one brush over another. Mediums: Mediums are mixed with the paint to change their texture and the way they move. There's so many. You'll learn about the ones that matter and ignore the ones that don't. Mediums are added to the paint to change the texture and alter the way the paint moves. Wet on wet: Applying the paint directly into another brushstroke while both are wet. So they mix right there on the painting. Blending: Making the colours into a seamless gradation from one tone to another. Layering: Building levels of paint where you see the history of different effects accumulating over time. Scumbling & Dry-Brushing: Applying small quantities of paint with a heavy brush to a dry surface. This creates a layered mottled effect. Vigorous & Mixed Colour Strokes: Some of the most exciting painting is when the artists goes nuts on the canvas with expressive gestural strokes where multiple colours combine in the same brushstroke. Impasto Textural Strokes & Palette Knife: Building thick gooey brushstrokes with either a rough brush or a palette knife. This usually involves using mediums. Sgraffito: Scratching into the surface or paint. Washes and Thin Paint: Washy effects can look beautiful or really crappy depending on how well you do them. Sharp Lines & Hard Edges: Fine lines are achieved using fine brushes or for hard edges by using tapeing. But how do you stop the paint from bleeding or looking bad? Glazing: Thin layers of transluscent colour applied layer by layour creates a beautiful glowing effect. Fine Details: How do you achieve fine details. Which brushes do you need? Class 6: Washes and Thin Paint. These images by Gorky are thinly painted. Here the smooth surface is really important and the right brushes to achieve washes and fine lines. When you paint thin the challenge is how do you achieve good paint quality. I created Art School Untangled to teach one of a kind courses that you can't find anywhere else. These courses get right to the heart of problems students face and focus intensely on a single issue. They're about putting in a lot of work over a relatively short period of time so that you can save YEARS of struggle. There's a lot to learn in painting and drawing but it doesn't need to take you decades if you learn it right from the start. Each week I'll give you excercises to work on at home so you can try things out in advance. The idea is that you'll already have some experience before launching into the class excercise. You'll also need to prepare your surfaces and possibly paint underpaintings that need to be dry in advance of the class. There will be at least 1 hour or more of homework each week. MUSEUM TOUR: For Week 1, we'll start the course with a tour at the AGO where we'll be analyzing real paintings. The idea is to understand the different kinds of painting techniques. We'll be talking about one of the most fundamental aspects of painting - Paint Quality. That's about making the paint actually look good. CLASS DEMONSTRATION: You'll be in a small class of 8 people max. I begin with a demonstration where I show you how to handle the tools, paint and mediums to achieve particular effects. Each week we'll tackle a different approach. In this class I will demonstrate in both oils and acrylics. CLASS WORK - COPYING PAINTING DETAILS: You'll be learning from the great artists of art history. In class we’ll be copying or at least being inspired by my photographs of painting details from museums around the world. I'm a big believer in copying as a great way to learn. It forces you to look deeply and to attempt to do things you're not naturally inclined to do. In this case you'll have to really figure out the painting history - how was the paint applied? In what order were the levels created. It also shows you how sophisticated great artists are. You’ll work from printouts and try to mimic the effects seen in the paintings. This will give you lots of experience trying to recreate all sorts of effects. CLASS WORK - SIDE PAINTING: I often encourse students to have a "side painting" which is just a surface sitting on the side of your work where you wipe your brushes or use as a tester for your techniques. This often turns into something interesting because you're not really trying. Who cares. You're just messing about and playing. This is an oppertunity to try out your techniques on something that might become a painting later. FEEDBACK: Throughout the class I move around the room helping you individually and giving tips on how to go about creating the effects with personal demonstrations. LIFE-LONG REFERENCE BOOK: At the end of the course you'll pull all your homework and class work together into a beautiful book. You'll have a comprehensive manual of all kinds of paintings effects, gestures and brush techniques. Week 5: Texture, Thick Strokes & Sgraffito. The artworks above by Canadian artists Jean-Paul Riopelle and Kathleen Munn both use palette knives to achieve their thick textural effects. In acrylic you have to use mediums mixed with the paint to do this. But which ones? When you learn to apply the paint you learn to paint. Let's be clear - this course requires discipline. It's a lot of work. There's going to be homework. You need to arrive with the right mindset. This is about doing the hard stuff that most people never bother to do. You'll be taking your paintings to the next level. I'm excited for this course. I've wanted to do this one for years. The paintings above all use different methods. Basadella is using thin paint. Alexandra Luke is building the surface with crusts of thick paint. Picasso and Joan Mitchell are using vigorous expressive and confident brushwork done fast and raw. 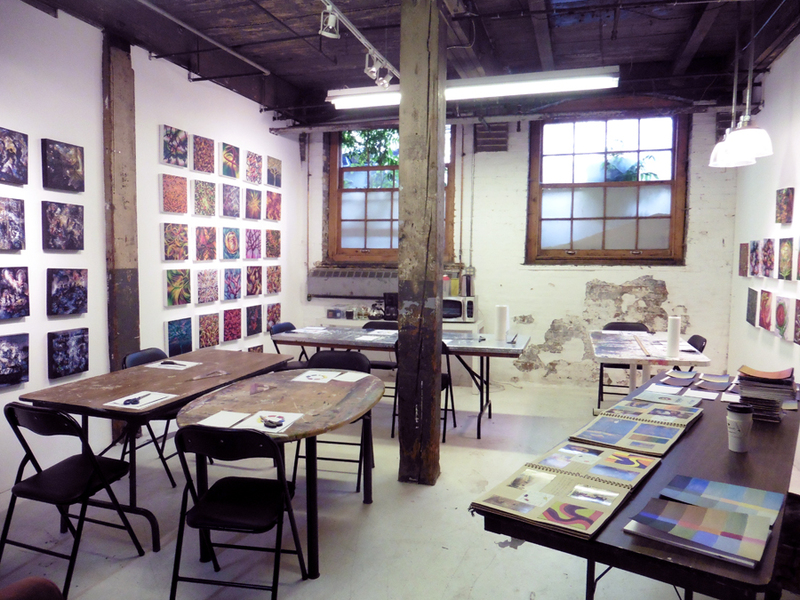 Class Location: My studio at 401 Richmond St. West, Studio S-17 in the Basement orange section. (At Richmond & Spadina.) See Google Map. Important Note: You must be able to attend the first class at the museum with one of the classes. It's essential. If you're unable to do this first class but are available for the rest of the course let me know. You could also attend one of the other classes first class. IMPORTANT: Your painting supplies are not included - see below. Week 8 & 9; Glazing. These paintings by Turner and Leduc both capture a beautifu sense of glowing light. The Turner is a combination of glazing and impasto. Week 10 - Fine Details & Finishes: Tues. June 11, 2019 - LAST CLASS! PARTY TIME! Week 10 - Fine Details & Finishes: Sat. July. 6, 2019 - LAST CLASS! PARTY TIME! NOTE: I will ask the class as a whole if we can agree on a replacement Sunday class so that we can complete the course on the June 22. You can SAVE $50 off your course price if you sign up a friend who hasn't taken my private courses in the past. I take $50 off for each person you sign up. No problem, I got you covered! I'm offering one FREE BONUS Sunday morning makeup class - Dates to be arranged later with the three classes. Week 3: Layering, Scumbling, Dry-brushing. These paintings by Monet and Renoir are both Impressionists but their approach is totally different. The Monet is a crusty accumulation of dry-brushing. The Renoir is made up of tiny vigorous brushwork with a small brush. Is this for Abstract or Representational painting? Both. I'll have painting details from abstract and representational paintings available for you to choose. In many ways the methods are the same. The same techniques can be used to create different imagery. I previous did some techniques workshops and intro to painting classes. How will this be any different? I never had anything remotely like this course. I had really basic instruction on a few of these methods. So I'm inventing this course based on what I wish I'd learned as a student. These are the things that would have made things much easier. It would have saved me years of trial and error. It's going to be unique. This will go way beyond a regular intro to painting class. I'm worried this might be too hard for me. Will I be able to do it? You gotta start somewhere. This is the reality of painting. My feeling is learn technical skills when you're ready for them. Every painter has developed their own methods but very few painters are actually taught how to do these things. It's not about making masterpieces. I'm a total beginnner. I've never painted. Is this appropriate for me if I'm new to painting? Depends on what you're looking for. This is my third course in my technical painting trilogy. I have two 10 week courses devoted entirely to colour. The Colour Mixing Detective is about understanding paint on a deep level and learning to mix a massive range of colours. The Colour Match Maker is all about understanding colour schemes and relationships and the stories they tell in your paintings. This course is about applying the paint. So I won't be addressing colour at all in this course. You'll be copying from paintings so if you feel like it will be impossible for you to mix the colours then I'd say start with The Colour Mixing Detective course. Beginners can do this course. I don't think this class is the best way to start for every person new to painting. You need to ask yourself a few questions. To me there are two types of art students. One likes to leap right in creating paintings and the main motivation is creativity and self-expression. This type is better off doing some paintings and then acquiring technical skills along the way when you realize you need them. The other type likes to have a technical foundation in order to feel comfortable starting to paint. They want some assurance of competence with the materials before launching in to the paintings. If you’re the first type you’re better off taking my classes like Outdoor Abstract City Drawing or Abstract Painting at Central Tech first. If you’re the second type then this class works perfectly. As long as you're committed to doing the full course no matter what. Remember that this class is for real. If you’re unsure, email me and we can talk. My classes are for real and designed to master the subject matter. They’re one of kind and intensive. You’ll have lots of time in class for the excercises but you'll need to do some homework. Can I paint in watercolour? Unfortunetly no. This course is just for acrylic and oil painting. Watercolour is a totally different thing. I'd have to come up with different technical methods for that. Perhaps in the future I'll do a watercolour specific version. Is the class wheel chair accessible? Yes. I’ve had a student in a wheelchair take the course. There’s a wheelchair ramp straight to the basement on the side of the building near Peter Street. There’s a ramp near the main entrance near Spadina Ave and an elevator on the main floor. Unfortunetly, the only wheelchair accessible bathroom is on the 4th floor. The elevator is close to my studio. Renoir and Augustus Johns both use a combination of glazing and vigorous brushwork with small brushes to achieve these effects. I'm unsure about this course because of the cost of the course and materials. Do we really need all these colours, brushes and materials? The course is 30 hours long and breaks down to about $15 an hour. I totally understand the concern about the cost of materials. Trust me I have the same experience every time I go to the art supply store! Making art in not cheap. You won't regret buying these colours, brushes and mediums. You'll be learning to actually use them. They will be the foundation of your art practice from this point forward. I've selected colours that allow you to mix nearly every colour you'll encounter. These are foundational. I'm doing my prep for this course in December. So I can't narrow down the exact brushes and mediums we'll be using just yet. Can I leave things at your studio? Yes, you can leave all your supplies and paper at my studio. However there is homework so you'll need your paints. What brands of paint should I use? I think you should always use artist quality paints from day one. One of the biggest issues students have with painting is using crappy student paints. By starting with professional paints you learn to paint once rather than having to learn twice when you end up switching. Good paint makes good paintings. For arylic I'd say Golden. For Oil I'd say Gamblin. Every student ends up switching to Golden so I'd start there. Acrylic: Most students work in acrylic as it's easy and dries fast. But if you plan to work in another medium for your paintings then use that medium. Oil: Working in oil is fine. You just can't use solvents in the studio. They're not necessary. Water mixable oils are also fine. Watercolour: This course doesn't work for watercolour as the methods are totally different. Check out my other classes. Unsure if this is for you? Ready? continue on to join us! My name is Gareth Bate and I’m a full time artist, curator and art teacher living in Toronto. I work in painting, installation and photography. I have an email newsletter called "Art Untangled" where I talk about art every week. You can subscribe here. I've been asked if everything I do revolves around art and the answer is pretty much yes! I've travelled extensively and visited all the major museums in London, Paris, New York, Washington DC, Boston, Montreal and Cape Town. I'm Festival Curator of the World of Threads Festival an international festival of contemporary fibre and textile art in Oakville. I graduated with a BFA from OCAD University and a diploma from Central Tech's adult art program. I've been teaching since 2008. I’ve been featured on CBC News and Radio Canada and in the Globe and Mail, Toronto Star, Now Magazine and La Presse among others. Class 7: Sharp Edges and Fine Lines. Above Rita Letendre creates incredible fine detailed lines and sharp edges. Below Leger also has fine edges but incorporates blending and gradations. Art Supplies are not included in the course fee. IMPORTANT NOTE: This is a new course. I'm going to be doing all my prep in December. So I can't give you the exact materials list right now. It will involve purchasing a variety of brushes and palette knives, canvases, paper and a portfolio display book. You'll need different painting mediums depending on if you paint in oil or acrylic - but especially acrylic you'll need to buy different mediums that change the consistancy of the paint. In acrylic that will include glazing medium, retarder, gel mediums, molding paste etc. I will give you the shopping list as soon as I can. It's crucial for all students to have EXACTLY ALL these specific colours in regular paint tubes ready for the first class. I'll send you pdfs with the pigment codes for each brand of paint. Match the pigment code that appears on the tube. You'll need access to every one of these colours each week. It might seem like a lot of colours but I've found that this colour palette allows you to mix almost every colour that appears in art history images. I recommend you purchase artist quality brands. I believe it's important to learn to paint with artist quality brands right from the start. You should ideally stick to the same brand. My stores will give you a student discount if you show them the invoice for this course. Artist Quality Acrylics: Golden (Best), TriArt, Windsor & Newton, Liquitex. Every student eventually switches to Golden and ends up disliking the other brands. So I'd suggest buying Golden upfront and not having to replace all your paint tubes when you inevitably switch. Artist Quality Oils: Gamblin (Best), Grumbacher (Best), Old Holland (Best), Windsor & Newton. So it’s time to make a decision. Or you can join us and learn to create beautiful exciting painting effects. Ten Week Course + One Free Sunday Bonus Makeup Class. That's a 30 hour course which breaks down to around $15 an hour. Plus the free makeup. Class Material Fee: There is a $50 fee for the in class paint demonstration supplies I use and colour photocopies each week. This will include some class supplies so you don't need to purchase all the mediums yourself. You can SAVE $50 off your course price if you sign up a friend who hasn't taken my courses in the past. When you book I'll send you an invoice. You can then send me an online e-transfer. You could also pay by check or cash during the first class. Payment is required during the first class. I'm 100% confident in the value of this course. I therefor don't offer refunds once the course has started. This is a small class. When you sign up you're taking a spot, so it's important to commit to taking the class. I offer a lot of information on this page to help you make a decision. If you're unsure, send me an email and we can talk about it. What medium do you plan to work in? Payment Method: Online: e-transfer or Mailed: Cheque mailed in advance of first class. Your Expectations: Anything in particular you're hoping to learn? After you register I'll confirm in an email and then send you an invoice and full course info and pdfs of the art supply list. Please share my courses with anyone you know who might be interested. Thanks! Borduas and Mitchell are using different methods to convey vigorous effects. Borduas uses heavy paint and a palette knife. Joan Mitchell uses bold messy brushwork with a matt finish.